When I looked at this revived thread, I was surprised that Gus Trim's stuff wasn't mentioned. (did I miss it?) ATrim's designs cover a large spectrum, but his simpler, pared down, performanc is just about everything swords have a very modern tone. The class that most exemplifies this is his tactical line. Unfortunately, he seems to have discontinued those blades. I have one, the tactical cuttoe, a high performer that IMO is the essence of a modern sword. Much has already been said about the form of swords following their function and I agree that if you want something that is going to function as, say, a longsword, then there are certain constraints to what you can and can't do to the design of the weapon before it ceases to function. 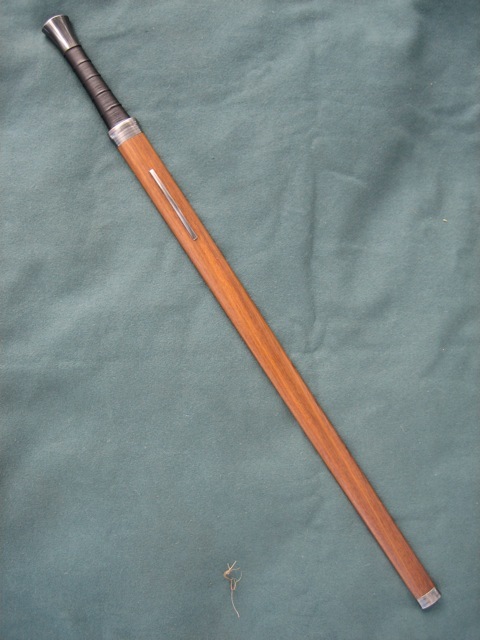 That function, though, relates to a combat form that relies to a large extent on you opponent being armed with similarly functioning weapons and so the design of modern "tactical" swords tends to vary substantially from the medieval sword archetype and usually - to my eye at least - ends up more in the form of a big knife than a sword. That said, I think there are arguably modern takes on the implementation of that functional design coming out of the more knowledgeable smiths working in the movie industry. The various swords Peter Lyon designed for the LOTR trilogy, the Chronicles of Narnia, and subsequent works he's built for the Weta Cave shop are to my mind modern functional swords. I'm rather partial to the one the Weta Cave has on sale at the moment, Aearil. It's definetly a longsword, and there are elements of it that obviously have their genesis in late medieval sword furniture, but I don't think there is any doubt that it is a modern sword. Posted: Tue 26 Jan, 2010 8:47 pm Post subject: Re: Why no modern looking swords? I'm less interested in fantasy swords as mentioned by G.L. Williamson. Their designs even look kind of weird and scary with spiked blades and guards (Example below). Just look atthat pommel I wouldn't want to handle that. I'd cut myself! Nice sword Peter! Did you make it? If so, how did you like making something like this opposed to a historical piece? Yes, I made this a couple of years back. I shall surely continue to make swords on the same theme: basing them on traditional design concepts (regarding function, dynamic properties and functional dimensions) but craft them as contemporary objects. It is liberating to sometimes approach the sword as something outside a context of past time. To see it as something that is made on its own merits: it does not have to be judged after how well it represents something else. 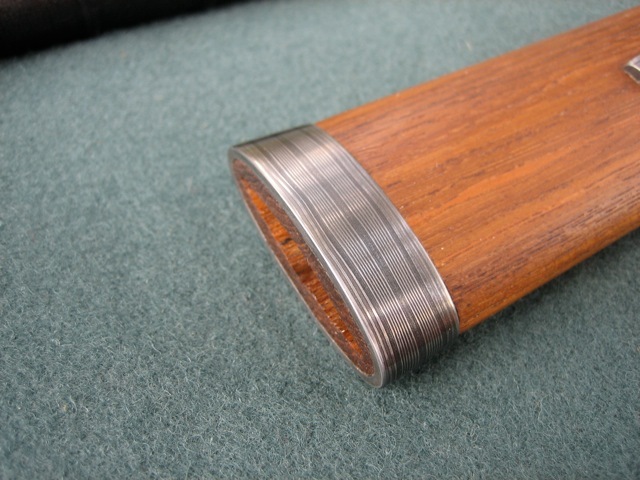 A sword made for a contemporary swordsman by a contemporary sword smith. The challenge that makes such a project interesting is to make sure it still embodies the essential nature of a sword. Peter, I think the relly important bit here is that modern make or no, that sword still represents what a sword ought to be - a deady weapon, that is made to perfection for the task it is intended for. Compare it to the crude... thing that is show in the picture on the top of the page in this thread by Shahril Dzulkifili. The sword you made seems to have style of .. "art nuveau" perharps it can be described? Yet it has the esential qulities that define a sword - elegance, purpose to the each of its components. 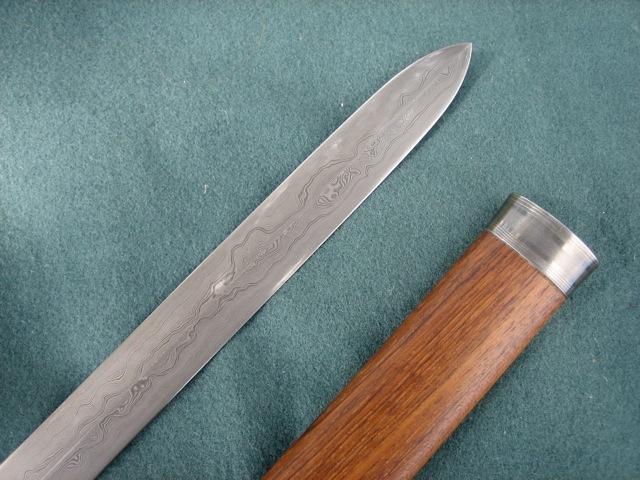 Below is an example of a sword that was made with the intention to be a timeless expression of a traditional sword type. I really like this, Peter. I think you nailed the timeless-yet-contemporary feel—neither too radical a departure nor too recognizably traditional. A good looking compromise between a more or less traditionally shaped weapon and a modern handle sensibility, without being a black coated slab handled thing more akin to a machete or big knife. I'm surprised no one has mentioned this sword. I't not modern, but it is relatively recent and it does resemble some of the modern "tactical swords." Yes, it's a reasonably good (if slightly heavy) reproduction of a Dutch Klewang. The Dutch army used these in frontline service, I think until the early 1960's, in New Guinea. Today, it's use is completely ceremonial. 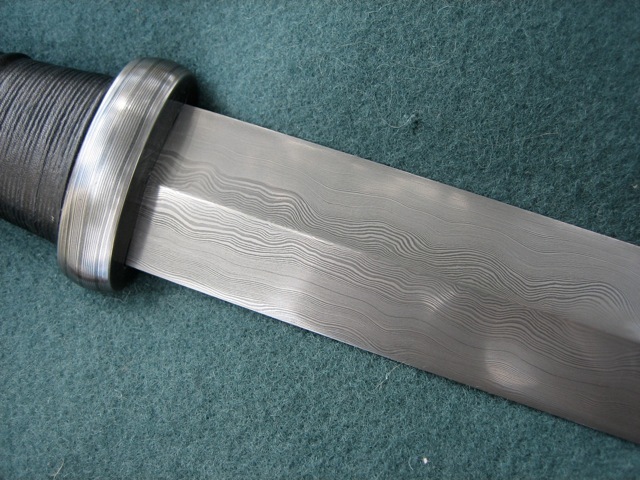 In fact, in the 21st C., newly made Klewangs have been ordered from WKC in Solingen, but although nicely made, these are no longer the workhorses that they were. 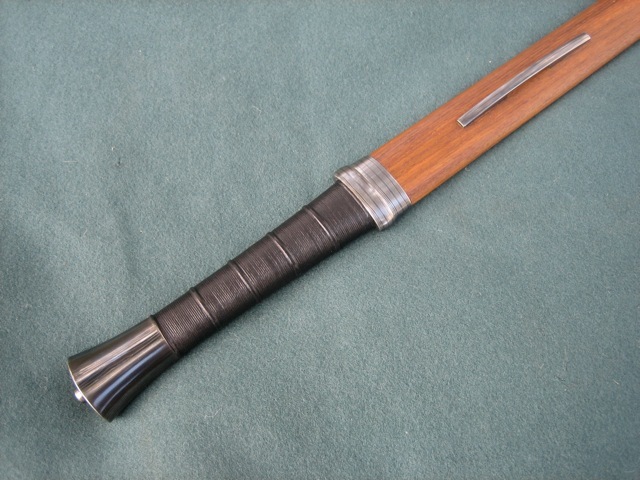 Anyway, the Klewang may have been the last infantry sword that has actually been used by a western military, not counting private purchases among special forces units. I've always wonder that myself, why there's not a modern swords. Theres knew materials always being developed that could be used in a modern sword. But at the same time I'm sure that a swordsmith could come up with something useful on the modern day battle field. But at the same time bringing a sword to a gunfight isn't the greatest idea. Maybe if they somehow incorparated a pistol with a sword that might prove useful in close quarters combat. Its just an idea. Plus I think most swordsmith are content in doing the tried and true method of sword making, no sense screwing with something that works. And no buyers seem to want to push them to another level of swordmaking, something that could be useful in the modern world. The world changes and martial arts should change with it, and if that involves putting something new into their system they should, but at the same time respecting there traditions. I believe thats for the best. 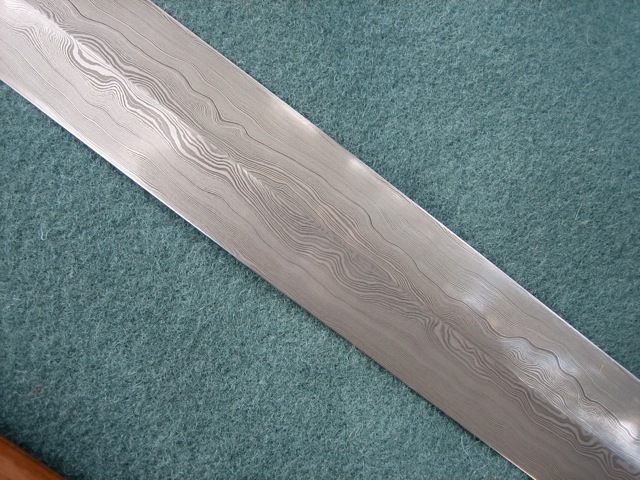 This leaves us with what aesthetic choices a modern sword smith might make. I would guess that modern swords would probably fairly plain compared to their ancestors, with little representational features or ornament, judging by the Modernist aesthetic that we are still under the influence of, in my opinion. I would think that they would be a study in form, transition, and line. Which sounds kind of vague to me, and really not all that different than a lot of medieval swords In a way, I almost feel like Albion's NG line represents what I am talking about. I am not debating that they are not historical at all, but a lot of them have quite a stark (not sure if that's the right word) aesthetic about them. There's no representational ornament, nor really much surface ornamentation either (beyond the finish), they're nicely balanced compositionally. They almost feel like they are pared down to the essentials, in a way. To me, they really do look like experiments in formal composition as much as weapons. Side note: This is not at all a bash on Albion or me calling into question their truth to the originals they are based on. I have seen some of these "pistol swords" but from what I've seen, there a pistol attached to a bayonet type set up, not what I'd really call a sword and granted I'm sure the market would be rather small for this. To be honest I'd say that maybe the only people that could be interested in it would be from the Spec Ops community. Some still use crossbows if the mission calls for stealth. Espeically since alot of modern Spec Ops like to view themselves a modern day samurais, I'm sure alot of them would want a modern updated sword in there collection, and if they could us it in a realistic way in battle all the better. Thats were the gunsword could come in, something you could draw fast. Just in case your main gun ran out of ammunition at a bad time. But can still has some reach to it, so you could take care of the baddies up close and those outta of range of the sword element. Its like my dad always told me it's not the weapon that make the difference its the person behind the weapon that counts. And I'm sure a Spec Op could figure outta a way to use it. If you want them to get somethin done tell them they can't do it and they'll figure out a way just to piss you off. Now I'm not saying a full on sword would be best at most maybe a 20 inch blade at most. It would still need to be balanced. So you could still aquire target at a fast enough pace. The grip would diffenatly have to be modified. I don't see a pistol grip being effective when used as a sword. But I could be wrong. I'd just think it would be awesome if someone would give it an honest try, bringing the old and new together. Remembering the past but still looking toward the future. Note: If I stepped on anyones toes sorry, but thats what makes America great. Bringing new ideas in and seeing if they work or not. We didn't get to were we are by sticking to tradition. We got were we are by respecting our tradition but still open to new ideas. Until recently were we've seemed to just throw tradition to the side and now were scratching our heads wondering what happened. Just my opinion. Thats all. The reference to martial studies within this topic provides another insight. Peter brings up an an excellent point, but it not only relates to the tradition of the crafting of swords, but in the ancient arts in general. To study an ancient and authentically traditional art of Kung fu would be based on techniques that have been handed down and practiced effectively in battle since ancient times. Since they are proven to be effective and unique, there is no reason to alter them. It would be the same as saying that Bruce Lee's "Jeet Kune Do" was a traditional and ancient art. It may be a compilation of several ancient arts, but has no real "evidence" of having existed as a singular "traditional" martial art in ancient history. "Haltet den Kopf unten and den Hammer am Schwingen!" Actually if you research Bruce Lee you'll find you that most of his "traditional" martial art peers didn't like him because he broke from tradition and taught people of other races the chinese martial arts. It even went so far that another sensei challenged him to a fight and if he lost he'd no longer be able to teach martial arts through the honor tradition. Of course he won. And why did he come up with Jeet Kune Do because he saw the weakness of his own art but saw the strengths of the other arts. So he did the logical thing and incorparated the strengths of the other arts into his own, Whing Chun. One of the arts he incorporated was Ikeado which is a relatively new martial art that came to in the beginning of the 1900 hundreds. Which focus is to use your oponites energy and use it against them. Plus the nunchucks he used didn't exist before him in the traditional martial arts. If you really want to get down to it Bruce Lee is the perfect example of sticking with tradition, but still looking for new things. I didn't mean to piss off any swordsmiths or blacksmiths. I do realize that you guys are artist and do exeptional work. I respect you guys even more because the art isn't around as much anymore. I was just trying to say this is how a modern sword could be. But at the end of the day a sword is a weapon and as such it should keep up with the times.